Gosh I can’t believe I have sat down to do a blog at last. Life has been very busy from the new year. Planning to decorate and sorting out how to do that. It does take a little longer when you don’t feel 100% but I do want to have a go. Trips to London to sort out the Launching of the Research Grants and the spreading of the word. I really want to encourage younger people to come forward with their ideas for Research into Mesothelioma. I have sent the advert to Uni’s etc etc so if you know anywhere please forward. I know it as the MK3475-28 Trial that I was so lucky to get on in 2014. I wouldn’t be here now if I hadn’t got on the trial and as I only had 1% PDL1 I almost didn’t make it. Now I have so much PDL1 thanks to Pembro. The story goes on and on so I wanted to pay back to the NHS for all their care hence My Foundation. It is unusual for a Foundation to be raised by a Patient as the sad truth is Mesothelioma is so deadly and takes a life in a few months. years I was given 3 months but I’m so grateful to be here 10 years later. and now please share around and help me find the person that has an idea of treatment. They might be at Uni our a student in a Lab somewhere I want to find that person and help him to help us Mesowarriors. This Foundation is built on love for fellow Mesowarriors in the future. They need us. The Mavis Nye Foundation is awarding its first clinical research grants to mark the first anniversary of the charity. Following a year of fundraising from hundreds of generous supporters, the Mavis Nye Foundation is welcoming applications for grants. One of the key aims of the charity is clinical research for the treatment of mesothelioma and other asbestos-related diseases and grants will be awarded for applications that fit these criteria. Clinical Research grants will be awarded for projects up to £10,000. The closing date for applications is 31st March 2019. The successful applicants will be announced in April 2019. We have lost so many lovely Mesowarriors since Christmas. I know this happens because winter brings virus and I to had the bad coughing one so I know how quickly we can go under. I had treatment stopped for 2 sessions and antibiotics. I had slept for 4 days solid so I did frighten everyone but I have recovered well and Im back on treatment and a scan will be on Feb 4th. This is the one that will decide whether I stay on the rechallange or a new trial. They are sequencing my DNA to find a drug we could use with Pembro. They are not happy with stable my team wants complete response again. Ray has a telephone appointment on the 30th Jan and then he goes into treatment for his non-Hodgkins Lymphoma on 1st Feb. I can’t get my head around that he has cancer as well and we have just carried on as normal. It is with great regret that I have to inform you at 11am Sunday 6th January 2019 Christine past away. To those people who knew Christine via this and other electronic platforms I thank you for the support, happiness, and joy you brought her, she derived great pleasure from your communications. Christine was a very special person and passionate about the causes she believed in, from her love of fighting for the rights of her beloved Staffy breeds to her staunch fight in raising awareness to the terrible curse of asbestos diseases. Christine dedicated many years of her life in the fight to ban asbestos globally, whilst striving to raise awareness in the UK through education of those workers exposed to this terrible killer dust. I met her and her husband Mark in 2010 when they were involved with IATP. She wasn’t a Mesowarrior but was in the world of Asbestos. I met her and her husband Mark in 2010 when they were involved with IATP. Happy New as I go into my 10th year of Mesothelioma. Yes it will be 10 years since Mar 2009 when we came back from Spain and I couldn’t breath. I started to do a look back on 2018 and trying and pick out the best bits but we have done so much, spoken at so many lovely venues and met so many lovely people. I think its time just to look forward to 2019 and make it the best year yet. Our Christmas has been just wonderful but what makes it so wonderful is to hear the family say that as well. We drove up to Luton on Christmas Day as I panicked about traffic Christmas Eve but I bet it was empty. A lovely Dinner was waiting Fortnum and Mansons Mince pies Christmas Pud and Cake such lovely food. So all full up we relaxed as we had eaten over several hours and lots of chat. Boxing day we went on our Christmas walk and can’t believe that two birds were fighting in the water and one drowned the other one. A woman was talking to us about how cruel nature is but really we humans are the same. After we put the world to rights we came home and more food. We didn’t go in the Motor Home and their bed is so comfortable hmmm I will be using that bed again that,s for sure. So that bought us to the best day as we came into London and to Somerset House and Ice Skating. No! I didn’t go on the Ice – Ray and I went shopping in Fortnum and Masons to buy a treat and then sat in a warm lounge and watched as they went round and round. Then I treated everyone to a meal in a Lovely Hotel. off to the show now and we had tickets for TINA which was just a brilliant, if sad story. 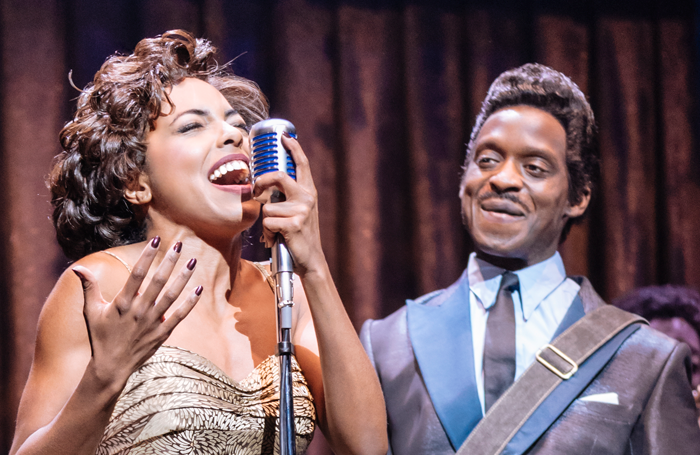 If you go to see it Brace yourself – here comes the next mega-hit jukebox musical. 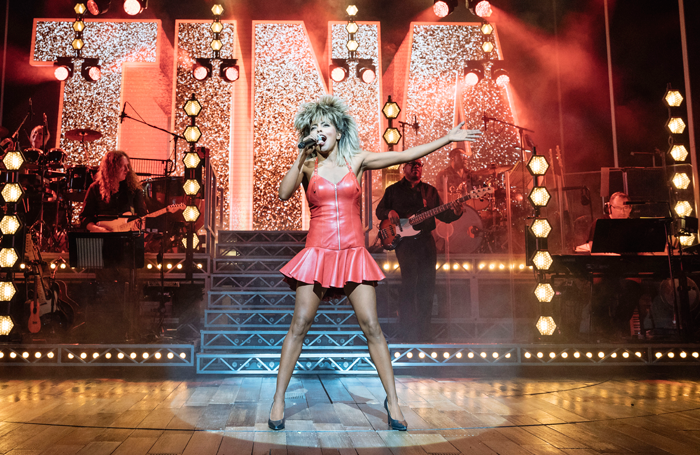 Tina, which opened with a bang in the West End this week and looks set to stay there for some time, is the latest in a long line of big-budget tribute-band bonanzas. 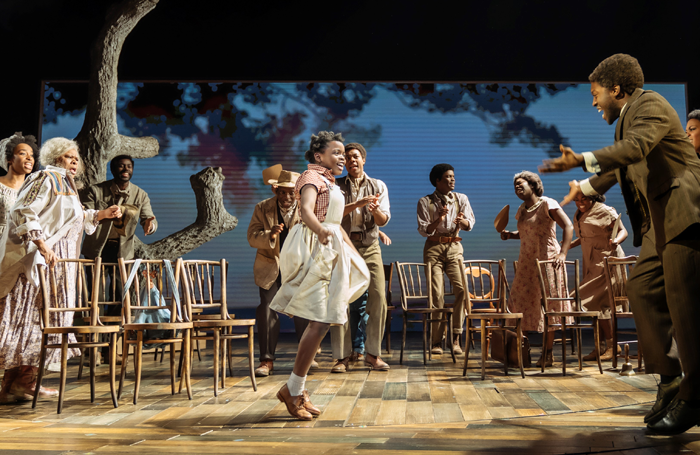 The legendary soul singer’s life story is put on stage in a production directed by Phyllida Lloyd, who took the reigns of ceaseless smash-hit Mamma Mia! back in 1999, written by Katori Hall, who picked up an Olivier for her play The Mountaintop in 2010, and starring American actress Adrienne Warren as Turner. Warren is pretty unknown in the UK – this is her West End debut – but she’s a big name on Broadway. Alongside her is British actor Kobna Holdbrook-Smith as Turner’s husband Ike, who manipulated and abused Turner during their ill-fated 20-year marriage. But will Warren hold a candle to the iconic singer? Will Lloyd channel the magic of Turner’s legendary live shows? Is this new jukebox juggernaut simply the best? I hated Icke he was so cruel to Tina. So that was our Christmas and a lovely one at that. We came home on a fairly easy traffic road on erm what day ??? we always have lost what day it is over Christmas. All the washing was done and then Monday was the Royal Marsden day. Life got back to normal early. New Years Eve- We got up at 4.30am but at 5.45 we sailed through on an empty road. we could have left later. The lady came in from Cornwall she had a bad journey as Aeroplanes messed up then she got off at the wrong station in London to get the train to Sutton so she had to wait for a taxi. The hospital was empty Ray asked if I had the wrong date in my diary but no I was right and I soon had my bloods taken. The Doctor made me laugh. He has told me Im the first person in the world that is rechallanging the drug and they are waiting for my next scan to know how to move forward. That is Feb.
Then the Doctor asked Ray how he was getting on and even examined his throat and under the ear. Turns out he knows Lymphoma well from his Australian training and the drug they are going to use works well. So we will know where to talk and ask questions when Ray gets his treatment in Feb.
February is going to be a big month for us. I do remember all the Mesowarriors that haven’t got through the year. Survivors guilt does weigh heavy of course. I miss so many from the groups and have added so many new ones. This must change we must do all we can. I must have been saved for a reason so I will keep going and work hard at the Foundation and raising money to help Research of Mesothelioma. If you wish to Donate to help me on my quest I would be very grateful and watch this space 2019 is going to be so exciting. My DNA and Medical case is going to be published by the Royal Marsden Drugs development. Also we are booked for many Conferences and so we have to keep our presentations up todate which is hard as the story changes all the time.